Steering radius is limited. No full lock to lock. The fork and frame have a matching groove/pin to limit the turning radius. Good --- no more steer tube to frame nicks. eliminating any damage to frame. Bad - will have to make wider turns especially at hairpin situations. However, there is an "access port" in front of the BB shell. When time to install new cables and cable housing - You must leave behind some sort of "fisher wire" as you remove or re-rounting cable housing may be impossible - very time consuming. Again because of no access thru the BB shell. Waiting for internal battery harness for my original di2 (10 speed, non e-tube) before I start my custom Serios S build out. Decided on the S version because of simplicity of front end adjusting and I resale value of bike when time comes. I will not be cutting the steer tube. Steer tube must be cut to size when using the DB TT stem. Waiting to hear if TriRig Omega brakes are compatible with the frame. will be updating photos as build progresses. the start and break down. The Omega X is indeed compatible with the Serios, and any other Shimano Direct-Mount applications (the new Cannondale Slice, for example). Any updates on the build or general impressions of the bike? I'm thinking about ordering one this week but am still debating over the serios or P2. Finally finished the original da di2 wiring and omega x brakes. Love the easy set up of brakes. Waiting for Hawk Racing pf30 bb then get to go ride. Will upload images tomarrow. No riding yet. 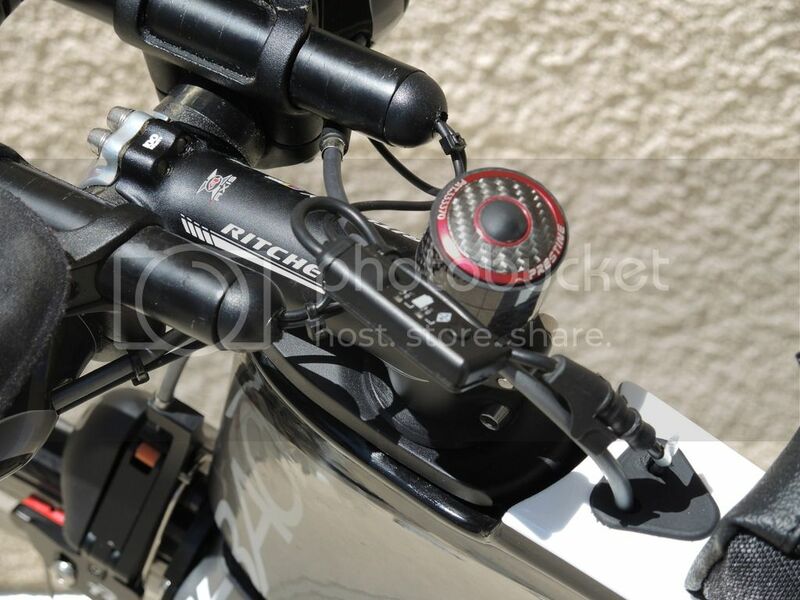 The pin can be removed, but as you pointed out � no more dings in top tube from handle bars or down tube from brake caliper. The turn radius is limited, but after a few rides on the Serios , I felt like it had more than adequate turning ability for most races situations. There is access thru the BB on the Serios. The Praxis BB on the Serios is one of their earlier designs that has a aluminum sleeve that is inserted into a frame prior to inserting the bearing cups. In this version, the sleeve must be removed in order to run the wiring. Praxis' newest Shimano BB for PF30/BB30 does have access ports thru the aluminum frame sleeve that will let a junction box through, making running of the Di2 wiring easier. The hardest part is running wire thru the rear chain stay. However, since I did not have the specific Shimano wire routing tool from Park (http://www.parktool.com/...ble-routing-kit-ir-1), I created a makeshift wire pull utilizing a typical shifter cable, running it through the frames chain stay from the Rear derailleur to the BB. Then I attached the wire to cable narp using a small piece of electrical tape. (in photo example below I used scotch tape to help illustrate).Then I slowly pulled wiring harness through chain stay to BB to connect to the junction box. routing all cables - must feed a filler line before taking out. easy enough but takes time. we did custom build with original Shimano 7900 Di2 (no e-tube wiring-so had to make modifications for frame to get the wires to fit inside. We installed Hawk Racing PF30 bottom bracket (to fit 46mm shell) to go with the RotorPower 30mm axle cranks. Serios has no outside Di2 battery mounts. 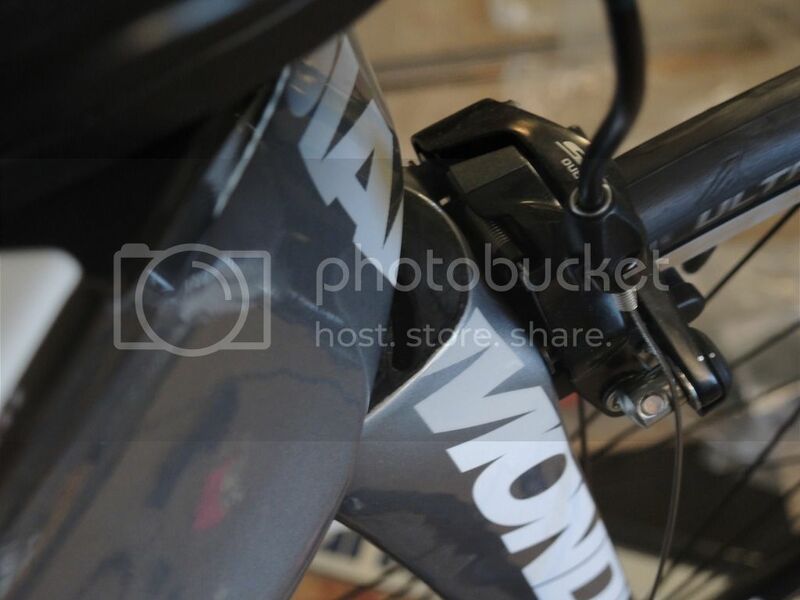 With Original Di2 wiring had do do a custom internal batter harness. Battery in now inside seat tube. Felt solid. dampens road vibrations very nicely. Limited steering (lock to lock) not a problem at all. No rattles - no extra noises. Quiet ride. Heavier than the Kestrel 4000. Frame size and build weight? One could definitely build a sub 18 lbs version. I had my first race on my Serios at Boulder 70.3, and it went great. The bike really seemed to be fast and handle well (all anectodal - can't compare times as I never raced there before). I'm happy with with the handling, and feel. I climb a lot around here (Santa Monicas) and it climbs and descends well for a tri-bike. You'd think after 1149 laps you'd learn how to spell it. Bam, I'm outta here. 11-speed modding to 10 speed seems a bit complicated and perhaps finnicky for race day. It is supposed to work on 10 sp. freehubs and could make your disc compatible with your new groupset. I have one of those on my road bike. Spacing at the hub is *slightly* different so it requires a little bit of adjustment at the RD but once set up it shifts wonderfully and is surprisingly light. That's another option to look at. I actually feel good about the way the disc is set up. I've ridden a few hundred miles on it and it shifts just fine. Even if I shift past the 25, with the limit set, it doesn't go anywhere. It still "thinks" it's an 11 speed, so I have one more click past my top gear. But if I click past the last cog, I just have to click twice to go back down. That, the sacrifice of 10 speeds instead of 11, and a little noise when I shift past the missing cog have been the only downsides. None of that will affect my race, and it all works reliably. Good to hear some decent real world reviews for this bike. 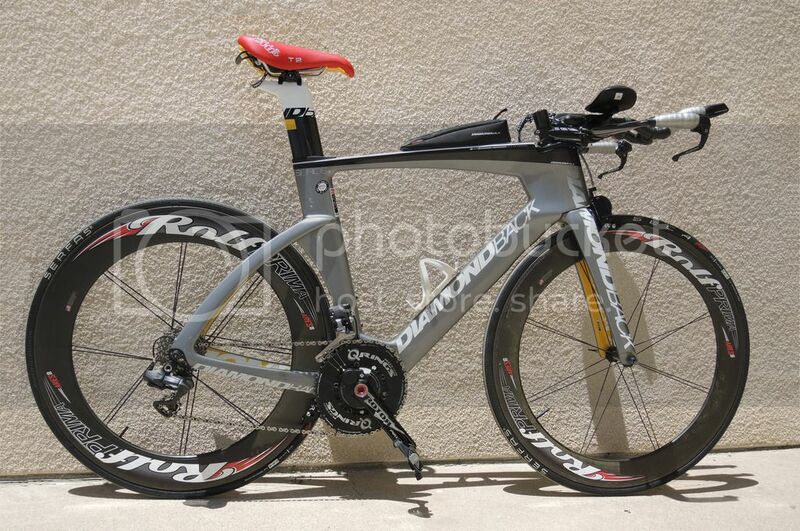 Unfortunately DBs lack of secondary wind tunnel tests have resulted in very little buzz around this bike. Anyways,decided to give it a shot and pulled the trigger on a Serios S today. 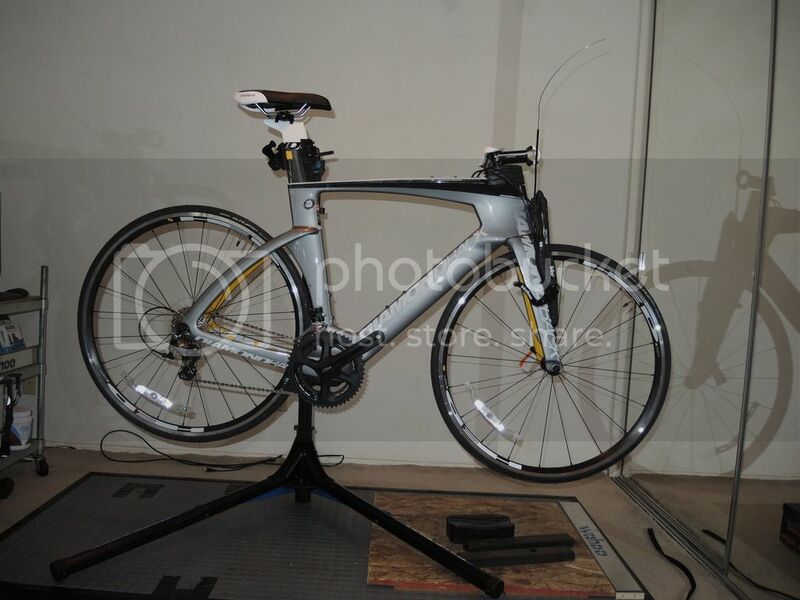 Coming from a used 2013 QR Kilo, I hope to spend some time getting fit on the new bike and start my journey into Triathlons. I do think its a great looking bike and very well priced, especially the S model. Plan on a couple TriRig mods. Mainly the Omega X and Sigma X ( when its released and if it fits the Serios S). Anyone else purchased a Serios yet? Thinking about ordering the S model over the Ordu and P2 due to cost and the layout. I tried to buy a frameset without the Corsair bar since I run Campy and already have a Corsair bar, but they did not want to deal. I guess they are not that "Serios" about getting bikes out racing. I plan on keeping my B2 until I can afford an IA or find a P2 frameset. While I do think it is odd that they do not do bare frames I think they are going to be firm on offering complete bikes with no mods. Honestly without the ST discount or Promotive discount I do not think many people are going to buy these. The prices they are listing at are too high and people will not look twice when they can get a P2 for $2800. Recently upgraded my Serios S with the proprietary stem from the expensive model Serios. Love the new sleek and aggressive look. Really cleaned up the cables. Which bar are you running?